This bright flower pop up is the perfect greeting card for the beginning pop up card maker. The design is simple, and the floral graphic elements are bold. It features bright green and purple flowers against a white background. This versatile pop-up card design can be used for almost any occasion. It is suitable for birthdays, anniversaries, Mother's Day and weddings. It can even be used merely to let someone know you are thinking of them. This greeting card is the perfect project for the beginning popup card maker. People have always been fascinated with pop-ups. It starts as a child with pop-up storybooks, and later in adulthood with intricate pop-up cards. There is something magical that happens when you open a flat card and suddenly have three-dimensional art appear from a two-dimensional space. Many people would love to make pop-up cards but feel intimidated by the complicated mechanisms of these greeting cards. It does take a lot of time, patience and practice to learn how to design this type of card but it can be mastered with a bit of perseverance. This particular project, however, removes all of the difficulties associated with pop up crafting. The template and die cut files are included in the free download. All you have to do is cut and paste. It doesn't get any easier than that. Just because a papercraft may be simple doesn’t mean that it isn’t beautiful. We believe in the design principle that “less is more.”There is beauty and elegance in simplicity. It always stands the test of time. The recipient of this card will appreciate the fact that you made an effort to make them such a unique greeting card. They will surely treasure it for years to come. Using a bone folder and ruler score a fold line on the 5.5" (portrait) mark on a purple sheet of card stock. This purple sheet of cardstock will be the outside back cover of the of the card. Cut the pop-up mechanism from a sheet of white cardstock, using a Xacto knife and ruler or a digital die cut machine. If you are cutting by hand, make sure to print the template onto the cardstock using the printable pdf file. The dotted lines on the template are the folding lines. Fold the pop-up mechanism using the above photo as a guide. The pop-up folds should resemble stair steps and will be the attachment base for the paper flowers. Using a glue stick or glue runner, apply glue to the edges and centerfold of the back of the pop-up mechanism. Insert the pop-up mechanism into the folded purple card stock. Make sure that the pop-up device is centered correctly and the margins are even. There should be one-quarter inch purple edge visible. Apply gentle pressure with fingers to assure paper adhesion. 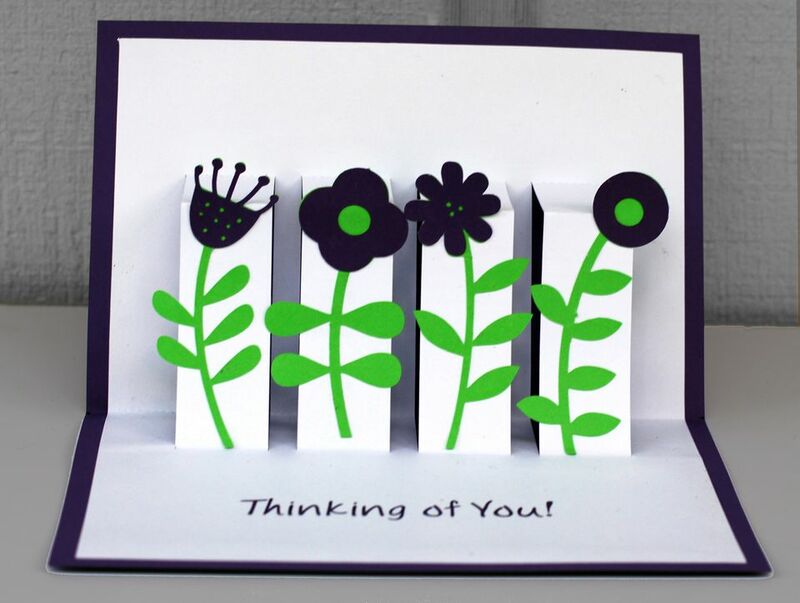 Cut out the green and purple flower parts with scissors, Xacto knife or digital die cut machine. Group the green pieces together in a row, and then group the purple pieces in a row. Apply glue with the glue stick to the backs of the purple flower parts. Place the purple flower parts on the green paper stems. Apply pressure with fingers to assure paper adhesion. Allow the glue on the paper flowers to dry before continuing onto the next steps. Using the above photo as a guide, place flowers onto the pop mechanism. Write your sentiment onto the card. Your card is now complete. Place it into an envelope and give it to someone you who tickles your fancy.